Congratulations to the Our Lady’s Bower swim team who excelled at the recent Connacht Schools Swim Gala in Athlone Regional Sports Centre, taking home six gold medals, one silver, and three bronze. 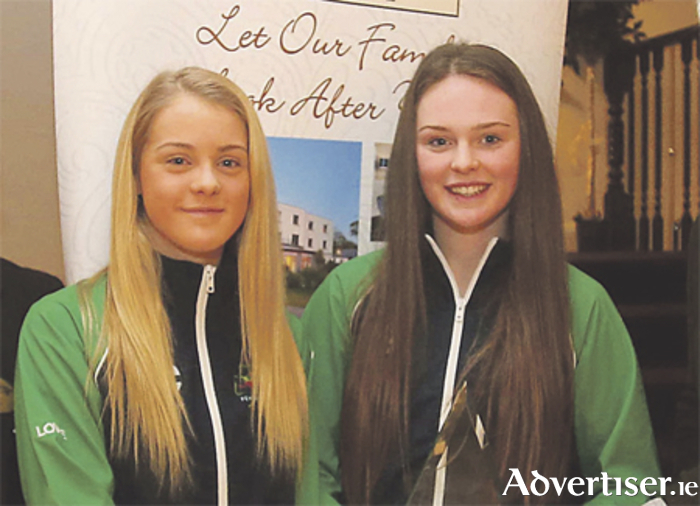 Two swimmers also qualified for the Connacht Interpro squad based on their performance. The most outstanding individual performance came from Rebecca Lowe who took home three gold medals for the 100m and 400m freestyle and the 100m backstroke, while Ellen Flaherty won gold in the 100m breaststroke and silver in the butterfly. Best senior swimmers were Sophie Lowe and Mae Barriello who won bronze medals in their events. The relay teams had a great day too with both junior and senior teams taking gold. The junior team of Rebecca, Ellen, Lauren Friel, and Síle McAuley were first in the freestyle relay while Sophie, Mae, Rebecca, and Ellen combined to win the senior medley relay. Based on their performances, Rebecca and Ellen will automatically qualify for the Interpro squad for the meet in Dublin in February. Bronze medallists Sophie and Mae can also still qualify. Squad: Eva Fitzpatrick, Cara Fitzpatrick, Eliza Heaslip, Síle McAuley, Lauren Friel, Aoife McDermott, Aishling McCarthy, Ellen Flaherty, Rebecca Lowe, Kelsey Daly, Isabelle Clarke, Sophie Lowe, Mae Barriello, and Louise Kennedy.